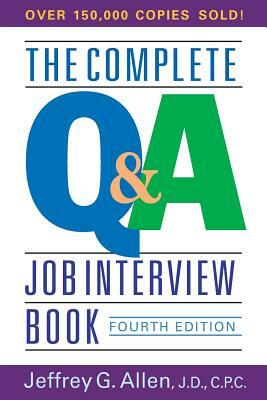 In The Complete Q&A Job Interview Book, Jeff develops your own personalized interview script to prepare you in advance for any question that comes your way. Covering questions on everything from personal background to management ability and technological know-how, he gives you a fail-safe delivery format for responding the right way every time. This new edition has been updated to guide you through today's changing job market, and includes an entirely new chapter on dealing with the latest open-ended interrogation questions. If getting a job is playing a part, this is your starring role. Follow the director, and you'll be a superstar. JEFFREY G. ALLEN, J.D., C.P.C., is the world's leading authority on the interview process and author of twenty-five career books with sales of over 400,000 copies, including the bestseller How to Turn an Interview into a Job.